Using a small screwdriver, remove the 2 front wiper arm covers. Operate the wiper, and stop the windshield wiper motor assembly to the automatic stop position. Remove the nut and the FR wiper arm RH. Remove the nut and the FR wiper arm LH. 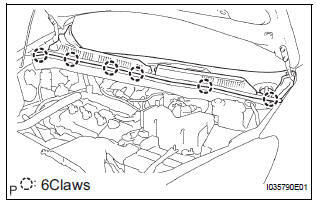 Remove the 6 claws and the cowl top ventilator louver sub-assembly. Remove the 4 bolts and wiper motor & link assembly. Using a screwdriver, disengage the meshing of rod at the crank arm pivot of the windshield wiper motor assembly. Remove the 3 bolts and windshield wiper motor assembly from the windshield wiper link assembly. HINT: Turning the crank arm by hand prior to the operation will be able to remove the wiper motor easier.